Gov. 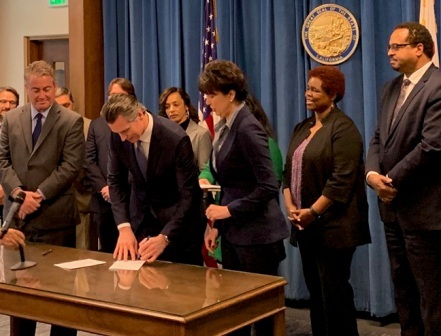 Gavin Newsom signed a “common sense” charter school transparency bill this week, striking agreement among a rare coalition of education reform advocates, labor leaders and traditional school educators. SB 126 is an application of the Ralph M. Brown Act, the California Public Records Act, the Political Reform Act and Government Code 1090 for California’s charter schools. Supporters of the bill say it adds more accountability and strengthens the flexibility and autonomy their schools need to innovate for students. For them, it also formalizes transparency and governance practices already followed by a majority of charter schools throughout the state. The California Charter School Association (CCSA) as well as individual operators of publicly-funded independent schools across the state are hailing the move by the governor. Many of them have been waiting over a decade for the bill to be signed into law. Former Gov. Jerry Brown vetoed it several times. The provisions in the new law, they anticipate, will correct a common misperception that charter schools are for-profit centers and are unaccountable to the public or the families they serve. The act mandates more than 1,300 charter schools across California to follow some of the same laws that govern school districts. Their board meetings are now required to be open to the public and board members are forbidden to vote on contracts in which they have a personal interest. Upon request, they are also now required to make their records available to the public. “Charter School of Morgan Hill (CSMH), like most California charter schools, has been following the provisions outlined in SB 126 for a long time,” said Paige Cisewski, Executive Director, CSMH.